One Eternal Day: "If God be for us..."
The extent of Suchet's commitment surfaced when "In the Footsteps of St Paul," a two-part documentary he made for BBC1, won the premier prizes at the Sandford St Martin's Trust religious programme awards in June. To accompany those Christmas programmes....he recorded "The Acts and Letters of St Paul," which were released without fanfare by Hodder. A further instalment of The Gospels followed at Easter. 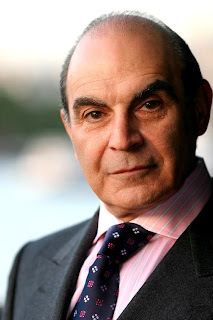 But the executive producer of the St Paul programmes, Ray Bruce, struck fertile ground when he suggested that Suchet record the entire Bible with him. The studio was just south of Tower Bridge, opposite Suchet's home on the Thames. "He always arrived prepared, for three-hour sessions … And then he went on to perform on stage. It was the most remarkable thing I have ever done in 40 years," said Bruce. Poirot has been shown in more than 100 countries, and it is estimated that between 600-700 million have watched Suchet's portrayal.